Before I move on with the continuation of my ever-popular crapper series I’d like to clarify something. The reason I am writing these is not to get some compassion for the misery that I and my countrymen had to go through. Even with the lack of modern conveniences millions of happy and meaningful lives were lived in the USSR. Many scientific breakthroughs were made by people who after work went back to their crappy communal apartments. Many cultural masterpieces were created by people with no running water in sight. Millions of children were conceived while someone else was sleeping in the other corner of the same room. On the other hand, there are miserable people leaving in the mansions with 6 bathrooms and loads of toilet paper. What I am trying to say is that life conditions are important but even more important are families, friends, surroundings, etc. When everything else is peachy, the toilet paper shortage is not so relevant. Now back to the subject. Outdoor plumbing is an oxymoron. There wasn’t any plumbing outdoors. In most of the rural areas and old parts of town for their natural needs people visited an outhouse. 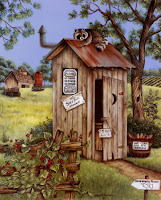 Regular outhouse looked kinda like this sans the raccoon, heating and funny signs. It was normally situated above the giant hole in the ground which sometimes was pumped out à la “Dirty Jobs”. (notice the abundance of the French words in my blog). I am not sure how the rest of them were emptied but I’ve never heard about septic tanks until I got here. Some of these were regular “squat” types and the other ones had a way to sit down on a toilet seat. If you ever get to visit one of these I recommend to not look down the hole. Just take my word on this. People who owned these outhouses kept them clean and tried to insulate them from cold. I’ve never seen a heated one, that doesn’t mean there wasn’t any. During the cold times of the year these places did not encourage prolonged sessions with a funny book.An old army joke talked about having to have a partner while going to the bathroom above the Arctic Circle: one will do his business and the one other will stand by with an axe in case the first one had to be separated from the toilet. In these areas liquids freeze before they hit the ground. As I’ve mentioned above, many toilet facilities were of the “squat” type where you’d find a hole of various shapes (with some evil crap inside, don’t look down) and sometimes there were markings where to place you feet. Feet placement was also guided by disgusting stuff on the floor. You just had to try not to step in the unknown hazardous waste (not all people have excellent aiming skills and that’s all I’m going to say about that). When I was in the army our outdoor facility was a huge concrete building with 40 to 60 holes in the floor and a 20 yard trough for #1 (I’ve heard that Chiefs stadium has some of these). In the morning, when 300 people visited it at the same time my eyes would tear up, and not because I was so proud or whatever. It wasn’t a smell anymore, it was a wall of ammonia-laden mist. Surprisingly,within few minutes, the smell became bearable and you could go on about your business. To sanitize the out-buildings they spread some kind of powder similar to mix of DDT, dry Clorox and Lysol. I should also mention that the building had no doors and partial walls so all the warmth was generated…sorry, I told you not to look down there. When we were on a mission they just dug a trench and surrounded the area with tarps (no roof). Notice that the squat toilets did not discriminate against handicapped, elderly and pregnant women. Just imagine doing it with any of these conditions. I still have great balancing skills. Sometimes people rebelled and improved the age-old design as shown in exhibit to the right. Sometimes it was more ingenuous than that but this will give you an idea. Notice that there are no dividers. Enjoy the company! If you are feeling deprived of the genuine squat toilet experience, some schmuck is promoting a device to convert your nice, comfortable throne into a squatting nightmare. It will cure your depression, impotence and make your hair grow back. I, on the other hand, will enjoy some time in one of my two bathrooms with an issue of “Consumer Reports”. P.S. This blog is not responsible for trauma caused by your attempts to climb up on your toilet. Do not try this at home.